Currently I’m running a stock S3 with aluminum bed, Beaver HDZ, custom linear X support, and Makita rt701c. This configuration has let me push 175ipm adaptive cutting on 6061 without issues or chatter which is amazingly fast for such a tiny cnc. The current goal is to reach the stock default maximum travel speed while keeping cut quality. Also I need to start seeing how much acceleration values can be tweaked to keep cut speed up. I’ll take some measurements on Z carriage weights from stock to hdz. I love the simplicity of the belt drive configuration but I think we’ll see it have issues over 200ipm. Just like a race car, go as fast as you can - break things, rebuild it better - go faster. I’ll post up all my findings and results here. Feel free to add anything guys! Cool, looking forward to your experiences. Keep the updates comin’. Care to elaborate on what you have in mind with regard to ‘rebuild it better’ ? I’ve always wanted 20mm rails and a ballscrew on my x axis… surely thats the next weakest link? It’s like a little miata, let’s see how far it will go and still be a “street car”. Trying to swing mgn12h rails for the X but that wont be for awhile. Unfortunately, all of the wider belts I’m aware of have increased backlash, save for the claimed 10mm wide GT2 profile available from some vendors. I’ve since changed out the steppers for higher torque ones. I’m still tuning with those, and I’m not convinced it made a difference. The higher weight of the bigger steppers (they’re about 3 times as long as the stock ones) looks to be offsetting their higher torque. They also have 8mm shafts, which made getting the right 21 tooth pulleys a little more difficult than I expected. Anyway, significantly higher speeds are available if you’re willing to try. It does make a difference in your cutting times by greatly reducing your time in rapid movement. The machine will move around more if it’s not held down well though. Why is this the current goal? Got a link to the motors? 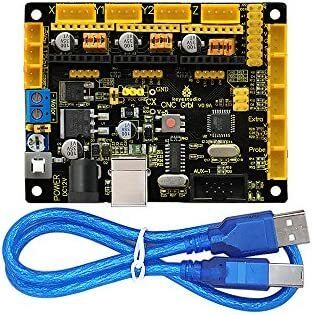 Still using the stock board and drivers? Looks like its stock belts then, thank you for that info Will. Honestly i’de rather not mess with the drive system too much anyway. Mike, those are an interesting option. The weight offsetting is something ive been trying to keep in mind. Looking at the HDZ there is quite a bit of fat we can trim from that as well. I try to use all the fusion cam tricks to reduce rapids already. A little work goes a long way there! MRR is driven by axial and radial cut dimensions as well as feed rate, why prioritize feed rate if MRR is the ultimate goal? In my experience on my two builds there is a certain sweet spot for radial and axial cuts depending on setup. Pass that zone with higher axial and lighter radial cut - overall machining time usually increased. But it looked cool…for those that want to do it for the gram lol. I steadily increased rpm with proper lube/heat mgmt and that let me stay in that sweet spot while increasing chipload. I would also like to point out that most of my shapes are pretty curvy and taking the biggest doc you can isn’t always the fastest way to 3d machine depending on finish quality/runtime/tool-changes. I’ve read quite a bit but I’m no expert. Just telling and showing what works for me. Thanks for sharing your experience and insight! Most of the posts that I’ve seen indicate that the S3s MMRs are limited significantly more by machine rigidity (and router speed) than router power - do you agree? Theoretically, any increase in feed rate would require a proportional decrease in either depth or width of cut to maintain the sweet spot. Does your experience support that? 2018-11-02 - I edited this post to remove “(except yours claiming a MRR of 20 lbs/hr)” because it looks like you were/are claiming only 2 lbs/hr (1/10 the cutting power and force). Sorry, I don’t know how I screwed that up! 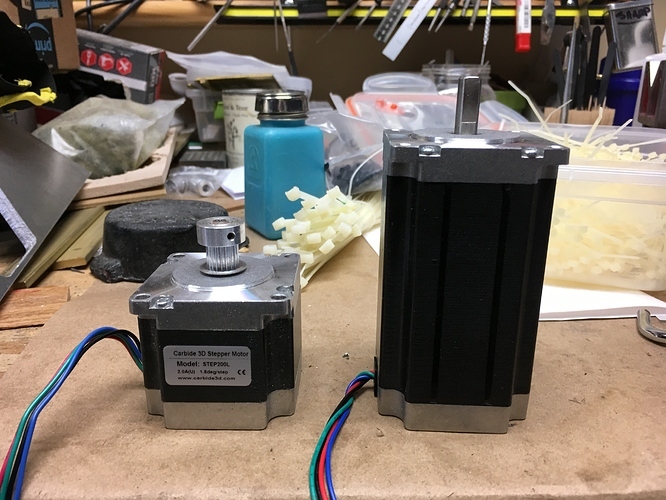 Those motors have a much higher inductance (17mH) than the stock (I think around 5mH). 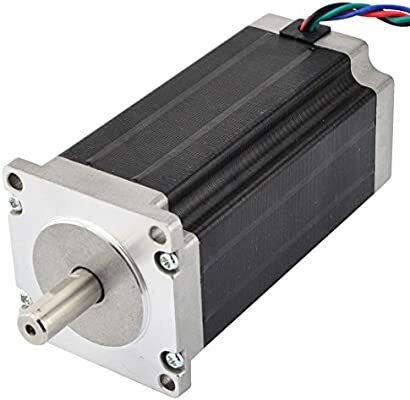 I’m getting out of my league here, but wouldn’t you need, or ideally use, a much higher drive voltage to get the speed and torque those motors are capable of? therefore- (√17) x 32 = 132 V.
Not very many drivers will sustain that… well not for long anyhow! Isn’t a lower current rating better all else being equal? I know the Carbide board limits what we can do. I’d bet you’d get a lot more out of those steppers if you used a 48v or 60v power supply and capable driver. 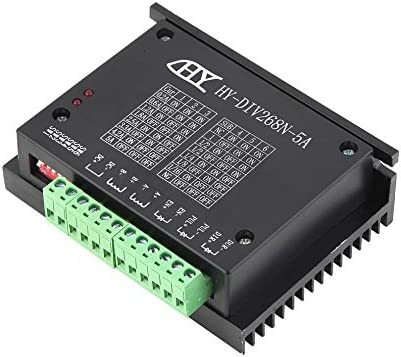 Have you measured deflection vs force and slippage with the stock S3 stepper motors? I don’t have a different driver. I want something based on the TI66xx series.